Brazilians love to buy in installments. In 2017, as ecommerce in Brazil generated more than USD14.4 billion, 60% of the purchases were made with credit cards. In more than half of these cases, choosing credit card as the payment method was something directly linked to the possibility to pay in installments, as 54% of the Brazilians who shopped online with credit cards in 2017 chose to split the total value into smaller amounts to be paid throughout the months. But why is the habit of paying in installments is so popular in Brazil, while in the rest of the world consumers are used to paying all at once? How did it all start? Those were recurring questions here at EBANX, so we’ve decided to do some exploring and figure it all out. 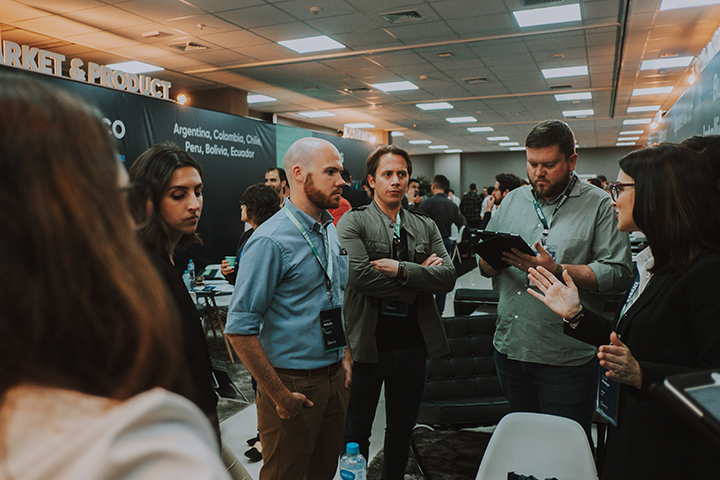 During the second edition of the EBANX Summit, an event that brought together merchant from all around the globe to talk about Latin America, we’ve brought our specialists from the Product Team, Sarah Nicolau and Rafael Lazzarin to discuss the topic through a workshop. When did Brazilians start to use installments? If you believed that paying in installments was something that started along with the usage of credit cards, you couldn’t be more wrong. The habit of splitting up the payment of purchases in Brazil began in the 50’s with the popularization of the “crediários”. As back then many people didn’t have enough money to pay for high-ticket items, the solution encountered by Brazilian retailers was creating this new method which consisted of the consumer registering at the store, buying items and paying for them through the next few months. This strategy was a hit for both consumers and retailers. Consumers gained more purchasing power and didn’t have to worry about interest; retailers ensured a new way of motivating customers to return to their stores and shop more often. Amongst the unstable economy of that time and uncontrollable inflation, that was the best way retailers found to make their business flourish despite it all. During the workshop, Sarah and Rafael stated that the success of that measure back then made installments become part of the Brazilian population’s DNA“. Nowadays, there are still Brazilian shops that offer old-school crediário or in more modern ways, such as offering customers the option to pay with private label credit cards. Before we tell you this story, you need to put yourself in the shoes of a Brazilian e-shopper with an average monthly income of USD 550. Have in mind that this monthly amount needs to cover all your basic expenses, considering that most Brazilians don’t have the habit to save money regularly. Say one fine day your smartphone breaks; buying another one and pay for it all at once could compromise half of your income. So, what would be a viable alternative? Paying in installments, of course. This is the reality of the majority of Brazilians and it is not hard to imagine why such a big part of the population finds in installments a way to increase their purchasing power. Because of that, installments is not something exclusive to the purchase of high-ticket items; with such a low minimum wage in comparison to the price of products, many Brazilians use installments even for their daily expenses. This might come as a surprise, but not only Brazilians use installments, it’s a reality in countries of entire Latin America, including Mexico and Argentina. The reality of these countries is very similar to Brazil’s, even with the accelerated growth of the upper-middle class in the region. Latin Americans face the same challenges that Brazilians do to increase their purchasing power, particularly when it comes to high-ticket items. The solution? You’ve guessed it right: installments. That’s why one of the key points to having a successful expansion strategy is offering local credit cards as the form of payment with the possibility of installments. This is the best way to compete in a healthy way with the local brands from the market you wish to enter. 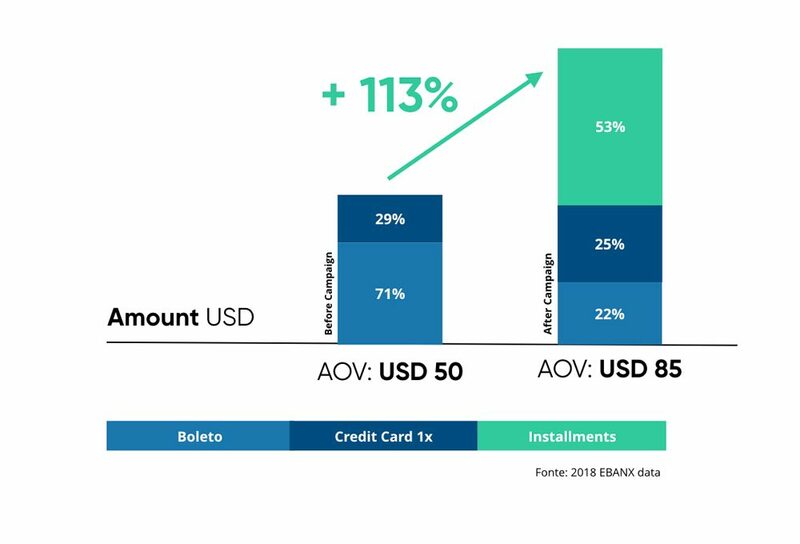 To illustrate how installments can be a transforming factor for the success of an international business in Latin America, we’ve brought two examples of websites that process payments with EBANX and that have started accepting payments with installments in Brazil. Before the implementation of local credit card installments, this retailer used the boleto bancário as the main alternative payment method. Only three months after implementing installments in their website, the brand had a pleasant surprised: sales more than doubled. And this was not the only positive behavior change, the Average Order Value (AOV) also had a significative impact. With the previous payment methods, in which the total amount needed to be paid all at once, the store had an AOV of around USD 50. Now, with the installments option, this number jumped to USD 85. Traveling is one of the greatest passions of Brazilians, yet the AOV of tourism services tends to be very high, thus, offering payments in installments is vital for the success of a company from the travel sector not only in Brazil but in entire Latin America. Particularly to Brazilians, it is very common for them to go back from a trip and keep paying for it through the credit card bills of the following months. 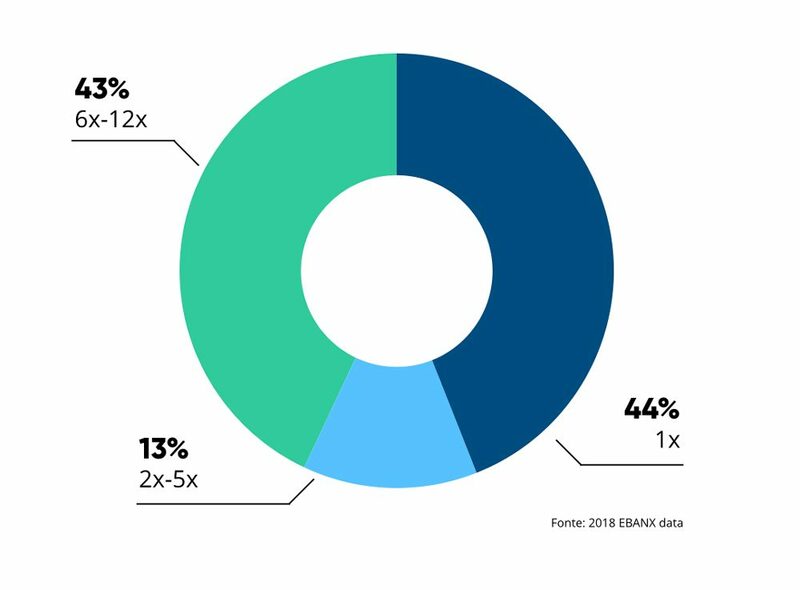 The graphic below illustrates this reality in Brazil; 43% of the users opted out for paying for their travel bookings in 6 to 12 monthly installments, even with interest charges in this case. Summing up, the reason why Brazilians and Latin Americans use installments so much can be resumed in only one word: access. Access to higher-ticket products, to a broader quantity of items and to a better purchasing power. Without this solution, the economic landscape of these emergent economies would dramatically reduce the purchase options of this population. This is also the reason why you need to think of installments as an essential path for a successful expansion to Latin America. Guaranteeing that all connected Latin Americans have access to your products and conditions to buy them is the first step to success.